﻿ Place2Stay @ City Centre, Kuching | FROM $12 - SAVE ON AGODA! "Overall about the rooms and location is great." Have a question for Place2Stay @ City Centre? "THE ROOM IS VERY BIG AND JUST NICE TO STAY." Designed for both business and leisure travel, Place2Stay @ City Centre is ideally situated in Kuching City Center; one of the city's most popular locales. Only 1.0 km from the city center, the hotel's strategic location ensures that guests can quickly and easily reach many local points of interest. A well-kempt environment and its proximity to Sri Srinivasagar Temple, Tua Pek Kong, Hornbill Fountain give to this hotel a special charm. Place2Stay @ City Centre also offers many facilities to enrich your stay in Kuching. Free Wi-Fi in all rooms, daily housekeeping, 24-hour front desk, express check-in/check-out, Wi-Fi in public areas are just a few of the facilities that set Place2Stay @ City Centre apart from other hotels in the city. Place2Stay @ City Centre is home to 33 bedrooms. All are tastefully furnished and many even provide such comforts as internet access – wireless, internet access – wireless (complimentary), non smoking rooms, air conditioning, desk. Besides, the hotel's host of recreational offerings ensures you have plenty to do during your stay. Enjoy unparalleled services and a truly prestigious address at the Place2Stay @ City Centre. "On top of it all, the hotel was the best there is compared t..."
Room was fine but no housekeeping services during our 4night stay..toilet looks old & smell sometimes..no elevator..there’s plenty of new place2stay hotel that just open..they look much better than this one. As soon as the door was opened, there was a damp smell. There is some garbage and sand on the ground. Only one light in the room can be opened. Some of the foot line tiles on the ground have fallen, but they are not filled up and are easily cut. The power of the TV was not installed, so it fell in the air. The remote of the TV can't be pressed. I called agoda's customer service to request a refund for the following night. No way to stay. This time around I was given the room on 3th floor. I guess you could imagine how diffcult it was to have drag my luggage upstair via the staircase. Its a budget hotel do not expect lift. Cleanlinest wise much to be improve especially the bathroom. My children's room the hot shower was not working so they took their bath in my room. The lady staff is friendly and helpful but not the men. The good thing about the hotel is the location. You can find banks, food outlet and hair saloon within walking distances. Room was spacious. However there is an overwhelming stench inside the bathroom. There was no lift access and front desk was behaving rather cold when receiving guest. I hope the management can fix the drawback. Thanks! everythings was fine. only the receiptionist was rude. when im arrived at the hotel for checkin, the guy took my ic and i waited atleast 20 minutes and i wonder what he is doing for taking so long to checked me in while he is just sitting in the counter? he is palying game(PUBG)) on his phone. SERIOUSLY? and my check out moment was bad too. check out time is 12pm, but the receiptionist called me at 11:45am said that i have to check out already. dude? i still have 15 minutes to check out right? and im still packing my stuff and of course i know check out time is by 12pm. even the receiptionist didnt give us a smile face on checkin/checkout time. overall about the rooms and location is great. Due to my tight schedule having a few trips to and fro from Kuching, this was the best hotel branch there is. They provide hot water and bath, and not to mention steam pressed iron in order for the customer to iron their clothing. But sadly there only one particular hot water dispenser on one floor and users has to come down to get it. On top of it all, the hotel was the best there is compared to the others. 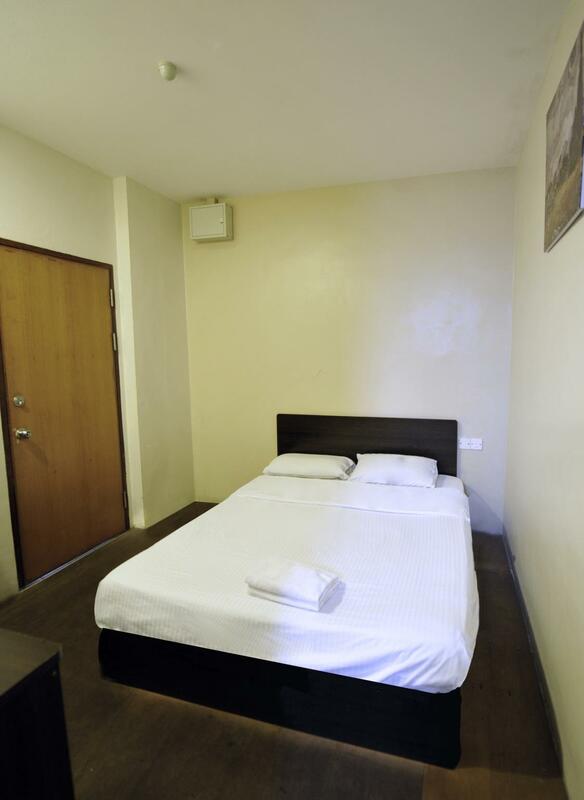 The facilities, cleanliness, value for money and the location are the best features for this hotel. But unfortunately, the reception counter staff should attend the customer service training to make sure that they are presentable and knowledgable. For a frontline person, I belive that they carry the hotel's name. Therefore, they have to carry themself properly. But the most important part is they have to get as much as they can to gather the information about Sarawak itself. In my opinion, they are not supposed to answer the particular question with 'i dont know'. Well at least try to make an effort to get the answer from any source that are available. Pros: strategic location(quiet), aircond ok, bed is clean Cons: toilet tiles are outdated, bed cover and pillows are old and torn out, towels are dirty, no tissue and toothpaste Verdict: although the room is cheap, but the room seems dirty and old fashioned, better upgrade the toilet facilities and change the worn out bed. Cons : 1.no lift even at 3rd floor 2.old buidling 3.old facilities 4.dirty toilet 5.smelly 6.old bed 7.limited plug 8.hot aircond 9.hot water bathroom very vintage also 10.no smart lock door and electrical/difficult to lock and open the door. No room service (cleaning daily) no 24hr towel replacement. bedsheets & towels too old. during check-in session, receptionist accidentally take my IC in counter, but never try to contact & inform me that i forgot to take my ic,till i contact them personally. Staff service is so bad. Their service like don't care about the customer. No lift provided. And the notice in the bathroom with Chinese subtitle is wrong. Please check it for the mistake. The design of bathroom is bad. Automatic door closer is not installed, might be dangerous if forget to close the door before you leave. Rooms bigger that the RH plaza's branch, definitely. But, sadly, the WiFi is still not very strong since the last time i've been, maybe 2-3 yrs ago. Maybe the management should reconsider to recheck the routers/modems available here. Thanks! I’m staying for 2 nights but for the 2nd they didn’t provide drinking water,smelly bathroom i need to buy cheap perfume to clear the smell. Broken remote a/c. I’ve stayed in other branch,its more than this branch. Tq. I arrived at that place and a skinny malay or indonesian girl (looks like malay but the slanga sounds like indonesian) "entertain" me and my wife with very rude manner. She doesnt give me a key and told me the key was already in the room. Me and my wife "climb up" (no lift) to level 3 and no key there. So i go to front desk again and she shout at me "saya cakap bilik 304 bukan 302". So i told her "cakap baik2 boleh tak". I to . After that I slam AC and TV remote to her desk and told that i want to check out right now because u are too rude. Maybe the room was cheap with promotion price RM 50. But in the hospitality industry, such incident should not be happened again. I am the "Place To Stay" at waterfront guest last year. Service is good at WF. But this city center girl really rude. Maybe she thing that i just want to buang air and get out. I am the loyal guest if u treat me good. U owe me my rm50, smile and respect. Please warn your staff. Overall to a budget hotel won'nt expact more than that, the two little puppy in love receiptionist a room needed for them, room203 should change the door lock! You can only open the door with key from outside, i was lock in the room when i'm leaving for work. Luckily my collegue stay in touch becauce the room without intercome or phone. When i told the receptionist she said the door was okay!!!!!!!!! Management problem with this hotel, we request for tax invoice. That staff say she can't open tax invoice on the sport. They need 2-3day to get the tax invoice. The girl say need to wait accounten to print out tax invoice. We not local people how we can't wait for 2-3day. We stayed in Room 202. We came back late in the night on the 1st night. When we used to bathroom, we found that the shower heater was not working, its holder kept dropping and no liquid soap in the dispenser. When we reported to the front office, staff told us that night was fully booked out, and also there was no one to help and therefore had to wait till tomorrow. Next day we reported matter again so as to be sure staff will attend to the problems. We were asked to leave our room key. When we returned late again the 2nd night, the front staff informed us that the heater had been repaired, passed a bottle of liquid soap since the dispenser was not repairable. When we entered the room, we discovered that the heater holder was still spoilt, heater still not working properly (kept tripping). On top of that the room was not cleaned at all (no new sheets, not new free water, no clean towels etc). We just stayed as it was late. Next morning we complained again, and were told that we had to leave our room key. When we said we did, were told that we had to inform them everyday if we needed to be cleaned everyday ! Can't beat the staff's' answers ! Always seemed to have ready answers for any complaint. Not staying here anymore, even if they drop the price to half! Good luck to them!